Today, Samsung (News - Alert) Electronics America, Inc. announced the start of commercial production at its first U.S. based home appliance manufacturing facility in Newberry County, South Carolina. Only six months after taking possession of the plant, Samsung employees have begun manufacturing ship-ready washing machines, producing the products' washer cabinets, inner tubs and bases from blank steel. Hyun Suk Kim, President and Head of CE (Consumer Electronics) Division of Samsung Electronics visited the Newberry plant to celebrate the official launch of production, along with the CEO of Samsung Electronics North America, Tim Baxter, South Carolina Governor Henry McMaster, U.S. Senator Tim Scott (SC), U.S. Representative Ralph Norman (SC-05), and Ian Steff, Deputy Assistant Secretary of Manufacturing, U.S. Department of Commerce, and other state and local leaders. "When we selected South Carolina for our new manufacturing facility, we chose a state and a community that believe in the power of innovation, and has the workforce to back it up," said President Kim. "It is thanks to the strong partnership we enjoy that we are here to celebrate the opening of our first U.S. based home appliance manufacturing facility." The start of commercial production comes just six months after Samsung announced the company would open a new state-of-the-art home appliance manufacturing plant in Newberry County, South Carolina. Since then, Samsung has transformed the site with the help of more than 800 full-time and contract workers, adding 151,000 square feet and installing two manufacturing and assembly lines with 20 presses and 30 injection molding machines. The two assembly lines combine Samsung's made-in-house components with supplied modules, then package those products for shipment to U.S. consumers. Samsung plans to produce one million washing machines at the Newberry County facility in 2018. To celebrate this historic day, Samsung is donating ten of the inaugural South Carolina-made washing machines to two Newberry based non-profit organizations: Boys Farm and the Freedom and Hope Foundation. Boys Farm provides unique foster care services for boys, serving as a haven for boys experiencing difficult family situations. The Freedom and Hope Foundation provides fishing and hunting activities as recreational therapy for active and retired wounded military service members and children with life-threatening diseases. Samsung will also provide an inaugural washing machine to the Newberry County museum to provide a lasting memorial to the historic day in South Carolina. "When Samsung chose South Carolina as the home for its new U.S. based manufacturing facility, the company chose a state and community with a passion for innovation and a dedication to building world-class products," said South Carolina Governor Henry McMaster. "Today we celebrate a major milestone in Samsung's journey here in South Carolina, and together, we look forward to a bright future." Samsung has already hired over 540 employees to staff the facility, 90 percent of whom are locally-based in Newberry County and surrounding communities. By 2020 the $380M plant will have created nearly 1,000 local jobs. Samsung has hosted or participated in seven job fairs and built an entire curriculum for workforce training since its announcement in June 2017. "I am thrilled to help welcome Samsung to Newberry County and South Carolina today," Senator Scott said. "I look forward to a productive partnership for years to come, as our world class workforce and competitive business environment mixed with Samsung's innovative ideas will produce amazing results." 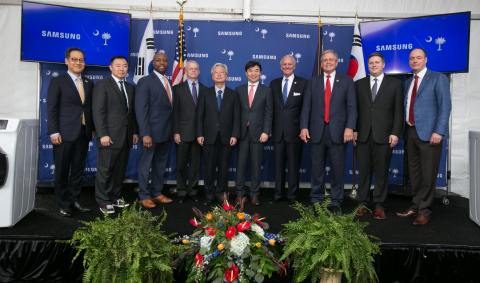 "I am extremely honored to help mark a momentous chapter in Samsung's history as an American manufacturing giant that has been creating jobs and innovating here for nearly four decades," said South Carolina Congressman Ralph Norman. "Samsung's significant investment in South Carolina and in the domestic large residential washing machine industry symbolize hope and opportunity for all of us." In December, Samsung announced a new research and development partnership with the state of South Carolina, Clemson University and the University of South Carolina to create the Palmetto Consortium for Home Appliance Innovation [PCHAI]. This robust R&D program will catalyze innovation, foster public/private collaboration, and nurture the next generation of advanced manufacturing professionals in South Carolina. "As we begin commercial production of washing machines here today, our vision extends beyond manufacturing alone," said Tim Baxter, President and CEO of Samsung Electronics North America. "Our ambition is for South Carolina to become Samsung's U.S. hub for every stage in the home appliance lifecycle-from concept and R&D to manufacturing, quality assurance, distribution and customer care." For more information about Samsung's investments in South Carolina, visit: https://news.samsung.com/us/press-kits/samsung-south-carolina-ha-facility-investment/?type=articles.